If there’s one overriding lesson thus far from the 2017 postseason, it’s this: Managing a baseball team through the playoffs is a nigh-impossible task. It’s hard enough to keep a team focused and prepared during the regular season, managing your way through road trip after road trip and injury after injury. But the postseason is a different beast altogether. A 162-game season comes down to one series, one game–sometimes even just one decision. Get it right, you become a hero. Get it wrong, though? Your name is mud. Sometimes, the mistakes are fairly obvious oversights. In Game 2 of the ALDS between the Yankees and the Indians, Joe Girardi opted not to challenge a hit-by-pitch on Lonnie Chisenhall, despite his catcher Gary Sanchez insisting that the ball hit the bat. Subsequent video replay showed the ball did strike the bat; Chisenhall would have been the third out of the inning. Instead, the HBP loaded the bases, and the next batter, Francisco Lindor, hit a grand slam to cut the Yankees’ lead to 8-7. The Indians would go on to win in extras 9-8, taking a 2-0 series lead. Chisenhall’s HBP set up Francisco Lindor’s grand slam. There was one problem, though: the pitch hit Chisenhall’s bat, not his hand. After the game, Girardi inexplicably defended his actions by stating that he “never wants to take a pitcher out of rhythm.” Coming from the manager who never seems to have a problem venturing from his dugout to talk to his pitcher, Girardi’s defense made no sense. Then again, neither did his failure to challenge the play. Suddenly the narrative after the game was about Girardi’s job security. One of the best managers in baseball was suddenly on the hot seat, for one–admittedly momentous–mistake. Girardi didn’t cost his team the game; Chad Green still gave up the home run to Lindor, and the grand slam still only made the score 8-7. But for a fanbase and a media market looking for a scapegoat, all eyes always turn to the guy in the dugout. The fury will only get worse if the Yankees don’t advance. Not every managerial error has been so clearly boneheaded. Tony Lovullo’s Diamondback squad got caught in a dogfight with the Colorado Rockies in the NL Wildcard. To secure victory–and a chance to play another game–Lovullo had to use his ace (Zack Greinke), a second starter (Robbie Ray), his bullpen ace (Archie Bradley), and his closer (Fernando Rodney). The effort the D-Backs put into winning the Wildcard game secured their place in the NLDS, but they may have emptied the tank; they were subsequently swept by the Dodgers. After a tense wildcard win over the Rockies, Tony Lovullo’s squad were blown away by the Dodgers. Were they just outplayed, or was it partially managerial error? Can you really in good conscience lay the blame on Lovullo? Of course not: in the winner-take-all emotional-roller-coaster that is the wild card game, managers can’t afford to leave impact players on the bench. Just ask Buck Showalter about that one. But if the D-Backs had Ray, Bradley, and Rodney fresh and ready to go for Game 1 in Los Angeles, would they have been swept? Hard to say, but it certainly wouldn’t hurt. The more unorthodox the decision is, the easier it is to critique. In Game 4 of the ALDS between the Red Sox and Astros, John Farrell (or Gary DiSarcina, who was acting manager after Farrell was ejected in the second) brought Chris Sale out of the bullpen in the fourth inning with the Sox down 2-1. He was effective through three innings, then gave up a solo shot to Alex Bregman to lead off the eighth. Sale ended up going 4 2/3 innings, giving up two earned runs and taking the loss. On the hot seat: After a second-straight ALDS loss, John Farrell is feeling the pressure. The potential critiques are endless here. Did Farrell/DiSarcina keep Sale in too long? If they had brought in Craig Kimbrel earlier, or gone to reliever Addison Reed to start the eighth instead, would Boston have held on to the lead? If the Red Sox had forced a Game 5, who would have pitched? David Price? Drew Pomeranz? Chris Sale, back on one day’s rest? One decision leads to another, compounding the difficulty. It also compounds the pressure: just one day after the Sox were booted from the postseason, Boston journalists are sharpening their knives and calling for Farrell’s job. Sometimes the team saves the manager. John Farrell’s opposite, AJ Hinch, made the questionable decision to bring in his ace Justin Verlander with a runner on first and one out in the fifth inning, his team holding a slim one-run lead. 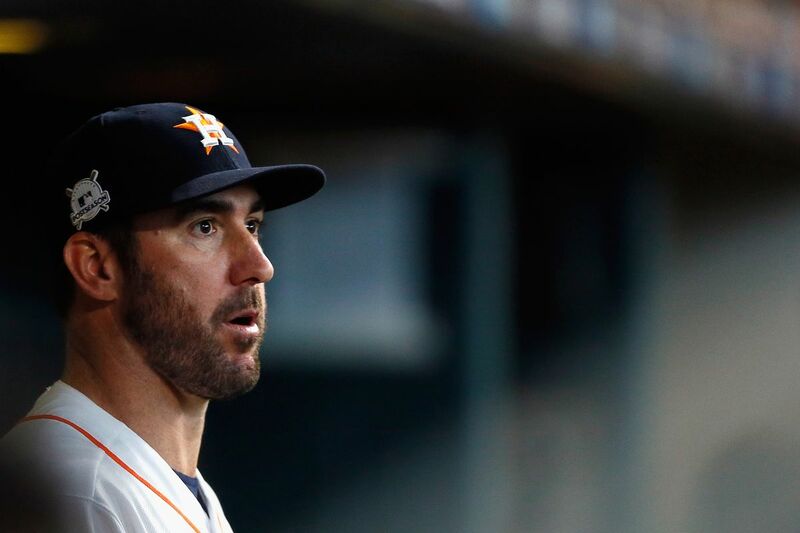 Verlander had over 400 major league starts, but not a single relief appearance. The decision quickly backfired: Verlander gave up a two-run homer to Andrew Benitendi, the first batter he faced, throwing away the lead in the process. The Astros retook the lead in the eighth to bail out Hinch’s mistake, but if they hadn’t? Hinch would have gone to a deciding Game 5 without his ace. “Wait…you want me to come into the game…now?” While the move looked foolish after JV gave up a two-run homer to hit first batter, the Astros’ ace settled in and pitched 2 2/3 clean innings after the home run. All these managerial decisions, from the questionable to the truly head-scratching, make the work of Terry Francona and Joe Maddon even more impressive. Neither Francona nor Maddon used their ace in their respective Game 1’s. Francona turned to Trevor Bauer instead of using Corey Kluber on short rest, and Maddon gave the ball to the hot hand in Kyle Hendricks rather than trotting out his nominal number-one guy, Jon Lester. Both moves worked brilliantly. Bauer threw 6 2/3 innings of shutout ball, giving up just 2 hits and striking out eight in a 4-0 victory. Hendricks outdueled Nats star Stephen Strasburg, throwing 7 innings without allowing a run while striking out 6. While the Indians have given away two games in New York, they head back home with their best pitcher–and one of the best pitchers in the game–on the bump in a deciding Game 5. The Cubs, meanwhile, lead the Nats 2-1, with a chance to clinch a date with Los Angeles later today. There’s a whole lot more postseason baseball to be played, and a whole lot more decisions that managers will face. Some will work; others won’t. Whoever wins the World Series will be heralded as a genius. Others will be fired for their perceived ineptitude. With every tricky decision placed under the most intense scrutiny, there is at least one truth to postseason baseball: the manager always take the blame.